With a semi-enclosed pilothouse, theres no need to cut your day short on the water due to blistering sun, unrelenting rain, or freezing wind. Two adults can escape these elements in full standing headroom. And equally important, there is an enclosed head forward and below the offset control station with generous headroom above the "throne". Other features include self-bailing cockpit, full walk-around access, forward casting deck, and lots of space for built-in wells, fish boxes, and integral seating areas. The easy riding hull features a 40 bow entry and 18 transom vee. Integral chine flats and double lift strakes each side of the centerline on the bottom pop the hull onto plane with little fuss. Plans detail single or twin outboards, or I/O units up to 1200 lbs., all with plenty of fuel available. Plywood sheet planking is easy to build and features double " bottom and 3/8" sides. Aluminum hulls are 3/16" on bottom and 1/8" sides. 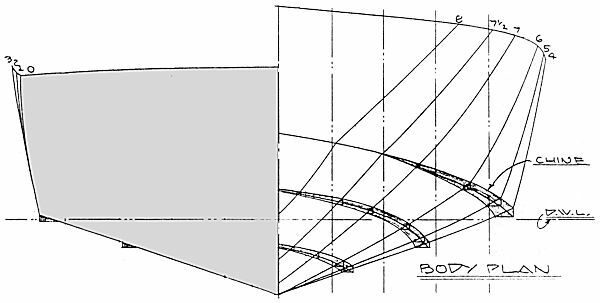 All plans includes FULL SIZE PATTERNS for framing backbone members, plus instructions, material list, and fastening schedule (wood hulls). Hull weight (approx.) 1250 lbs. Trailer: Designed for use with Glen-L Series 5000/6000 boat trailer plans.